As we’ve learned on a couple of occasions, when you lose friends that have been around you during a visit somewhere, they leave and you tend to feel like Billy Nomates – you might as well leave yourself and go somewhere new. Since Mike & Linda had left for Cognac, we were off today, too. For a couple of years I’ve been exchanging information about dragonflies via email with an expat living over here in France. Before starting our trip, I’d floated the idea with him that we might actually meet face to face, for a change. This week he was supposedly free, lives near the Parc Naturel Regionial de la Brenne, and had offered to meet us. So, as part of our journey back north, we’ve planned to return to La Brenne to meet my e-contact. Before our meeting tomorrow (Tuesday), after a breeze of a journey we pitched up at lunchtime today to entertain ourselves for the afternoon. 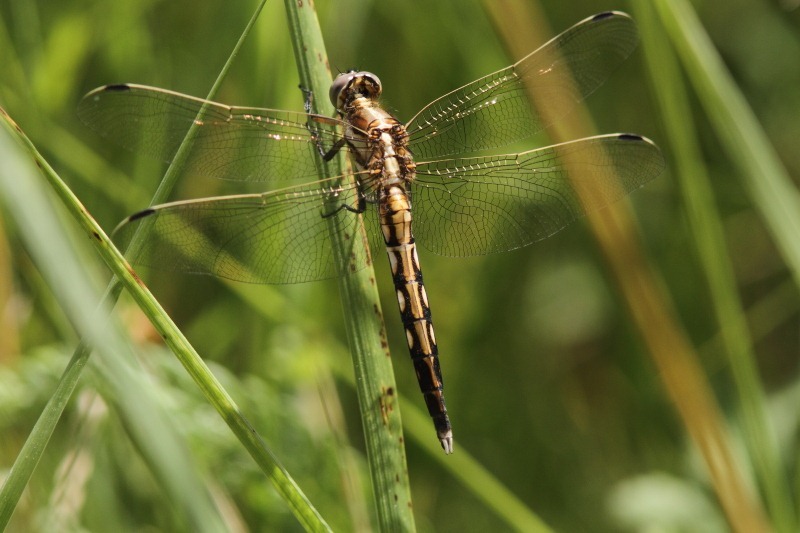 The étang de Bellebouche is one of our more prolific Odonata sites, currently registering 19 species. Most of those occur round two small fishing lakes just behind the campsite itself so, after a relaxing lunch, we set off to see what we could find. During our one-night stop on our way south, I’d seen a suspected new species for us, a Southern Emerald Damselfly (Lestes barbarus) and one of my missing females, a White-tailed Skimmer (Orthetrum albistylum). My first capture of the afternoon wander looked like a better positioned female White-tailed Skimmer but, upon closer examination, this was no lady, it was a teneral male before developing the characteristic blue pruinosity. Happy camper! 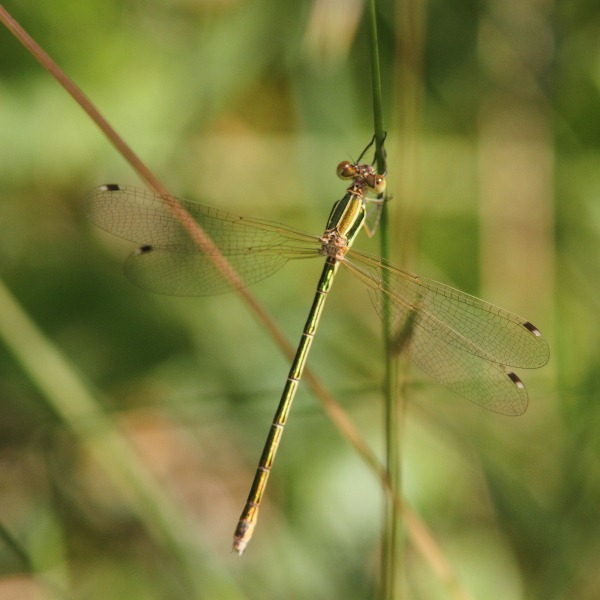 I had been unsure about my Southern Emerald Damselfly because the pterostigma, the coloured spots on the leading edge of the forewing towards the outer edge, were uncoloured; they should have been bicoloured, split about 50/50. That was early in the season, though, and I suspected it was teneral [recently emerged]. This afternoon I was pleased to find examples of mature individuals looking the same except for the fact that their pterostigma looked right. My doubts disappeared. Now we’re looking forward to seeing what my e-contact might be able to show us tomorrow.